In recent years, we’ve heard a lot about the extraordinary workings of our hundred-billion-celled brain: its amazing capacities to regulate sensation, perception, thinking, and feeling, its ability to shape all experience and define our identity. Someone was talking about how she should have seen what her ex-significant other was up to with all of his sweet words. He was in prison, and telling her how he had changed and found the light and how wonderful things would be when he got out. She knew what he had done to get in there, the bad acts he had committed, but she chose to believe his “sincere remorse.” Now she wanted to know why she had been so stupid. After reading Steve Becker’s article yesterday, I commented that most of the articles here on Lovefraud that could be entitled “1001 Things I Did Wrong in Dealing with a Psychopath” were the ones that applied most to my own dealings with them. I got to thinking the other day about how our strength and ability to carry an emotional load of “stress” is sort of like a long-distance walk or ride or race. People who travel in various long distance endurance races, or just for their own purposes, have to limit the amount of weight that they carry. Some people who do long distances on foot even cut the handle off their toothbrushes to reduce the load they have to carry by even a fraction of an ounce. The other night my son and I went to a rodeo with a a couple who are our friends to watch another friend ride in the rodeo roping contest. My friend is currently somewhat “down in her back” and will be going to a neurosurgeon for treatment this coming week. When we got up to go to the concession stand she asked me to go over and talk to this man who was selling some “pain relief patches.” She wondered if they would help. Someone recently forwarded to me one of those funny e-mails that we almost all get on a daily basis. 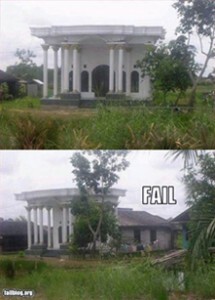 This particular one was from a site called “failblog.org” and showed a photograph of a pretentious front entrance to a house from the front, and then showed the same house from the side, revealing what lay behind that pretentious entrance faÃ§ade. Most of us know that when you combine gasoline and fire there is not only a larger fire, but an explosive one. Our here in the boondocks we have occasion to burn brush piles or even trash sometimes and anyone except some pure idiot knows you never use gasoline as an accelerant for burning anything, you use diesel. Diesel fuel is more akin to what they call fuel oil up north and they fuel their household heaters with it. It ignites slowly without a lot of vapor and burns steadily, not causing an explosion. Yet Being Someone Other is the title of one of my favorite books and sometimes I think that title applies to me as well, at least since I recognized the post traumatic stress disorder (PTSD) that has become such a part of my life these last six years. Now I’m “someone other” than who I used to be. I’m not the same person at all. I no longer think like that other person did, that FIRST ME as it were. The NOW ME is different.